In cinemas this week: X-Men: Days of Future Past, The Babadook, Sunshine on Leith, My Sweet Pepper Land, Ida (in some states, others 29/5) and Son of God. X-Men: Days of Future Past - The sequel to X-Men: First Class, set in an alternate future where all mutants are hunted by giant, government-sanctioned robots called Sentinels. The storyline alternates between 1980 and 2014 as the X-Men venture back in time to stop the Sentinels from conquering North America and placing all the mutants they can capture into internment camps. 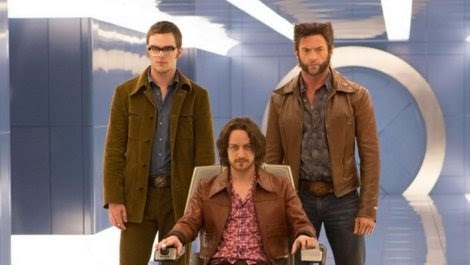 On the eve of a feared nuclear holocaust, the remaining X-Men send Kitty Pryde's (Ellen Page) mind backward through time to possess the body of her younger self in order to prevent a pivotal event in mutant–human history: the assassination of Senator Robert Kelly by Mystique's newly reassembled Brotherhood of Evil Mutants. Sunshine on Leith - Home is where the heart is for best friends Davy and Ally. Returning to their lifelong residence of Leith, in Edinburgh, the lads kindle romances old and new: Ally plans to propose to Davy’s sister Liz, while Davy falls head-over-heels in love with Yvonne. Meanwhile, Davy's parents Rab and Jean are busy planning their 25th wedding anniversary. Everything’s going swimmingly, until a revelation from Rab’s past threatens to tear the family and all three couples apart. The second feature from actor-turned-director Dexter Fletcher, Sunshine on Leith is a jubilant, heartfelt musical about the power of home, the hearth, family and love. Adapted from the acclaimed stage musical by Stephen Greenhorn it features the euphoric music of The Proclaimers. My Sweet Pepper Land - Baran is a hero. Or was – ever since Saddam fell, the Kurdish army has fallen apart. Becoming police chief in a remote border town, he is determined to bring order to the place and stand up to outlaw leader Aziz’s self-imposed ‘justice’. But when he meets defiantly independent schoolteacher Govend he not only finds something to fight for, but also something that may destroy him whole. A finely tuned drama with a humorous edge, My Sweet Pepper Land is the latest work from legend of Kurdish cinema, Hiner Saleem. Playful and provocative, it’s also a warm, witty lampooning of the John Wayne western from a corner of the whole where the Wild West still exists. Ida - From acclaimed director Pawel Pawlikowski (Last Resort, My Summer of Love) comes a moving and intimate drama about a young novitiate nun in 1960s Poland who, on the verge of taking her vows, discovers a dark family secret dating from the terrible years of the Nazi occupation. 18-year old Anna (stunning newcomer Agata Trzebuchowska), a sheltered orphan raised in a convent, is preparing to become a nun when the Mother Superior insists she first visit her sole living relative. Naïve, innocent Anna soon finds herself in the presence of her aunt Wanda (Agata Kulesza), a worldly and cynical Communist Party insider, who shocks her with the declaration that her real name is Ida and her Jewish parents were murdered during the Nazi occupation. This revelation triggers a heart-wrenching journey into the countryside, to the family house and into the secrets of the repressed past, evoking the haunting legacy of the Holocaust and the realities of postwar Communism. In this beautifully directed film, Pawlikowski returns to his native Poland for the first time in his career to confront some of the more contentious issues in the history of his birthplace. Ida is a masterly evocation of a time, a dilemma, and a defining historical moment. The weight of history is everywhere, but the scale falls within the scope of a young woman learning about the secrets of her own past. Weekly Recommendation: Strong titles. Interesting. Different. The Babadook is one of the best genre films to come out of Australia in recent years, and driven by an exceptional performance from Essie Davis, it genuinely scares. I have every intention of catching the well-reviewed Sunshine on Leith, the Cannes-selected Kurdish western My Sweet Pepper Land and the superhero film of the week X-Men this week, as well as the exquisite-looking Ida when it comes to Sydney cinemas May 29.